We've been here in NC for ten years now, and this is the very first winter storm that we've been threatened with. Right now it's a cold and raw 30 degrees. Bill has just covered the wind shields of both vehicles in case we get the freezing rain they're predicting. I can remember in NH how during the huge winter storms, we would sit and watch from our living room windows or from the kitchen. The sound of the huge plows cleaning off the road and distributing the sand and salt. I sure don't miss the long winters up there, but do have some wonderful memories of them. So today, we're inside with the wood stove going and we're seeing that the wind is picking up as expected. All schools are closed in our county as well as many other surrounding us. We didn't have to make any emergency trips to the store for anything and I have some good meals to hold us over planned. We're warm and cozy, and my stitching chair is calling me. with just 13 colors total. One being a skein of black for a tiny bit of back stitching. Now here's my start below using all colors asked for except the black, and I'm doing mine on off white Aida. Now how pretty is that? Have also been doing a facecloth or two when I want to do something that requires a lot less attention. Here's the one I did up a couple of days ago. Right now, I'm just storing them for later on little gifts. There are so many nice color combinations. God is so good and prayers continue to be answered. Another biopsy from Bill's chest came back benign. Prayers from so many wonderful friends and followers have helped through this past year so very much, and I thank you all again. I see that I have some wonderful new followers through "Grow Your Blog" and I am so very thrilled. I've been looking for my new followers blogs so I can return the visits and do some joining up as well. I look forward to getting to know each one of you as a dear friend. Thank you so much for signing up to follow me. I see that the icy rain has begun and the wind is still blowing. Thank you for a warm home Father and watch over anyone who has to be on the roads the next couple of days. Until next time. Stay safe and well. Keep warm and remember to "feel the colors". Love you all. Thanks for stopping by my blog. I am enjoying the heck out of my retirement. My family back in Virginia can never find me at home anymore. 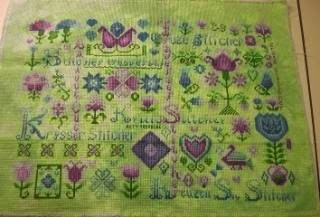 Love your sampler, but have decided not to buy anymore for 2014, I am going to stitch on my WIP's for this year. Stay warm! Wonderful news about Bill...so pleased for both of you. Crazy winter. Stay warm! The colors in your pieces are bright and cheery. Stay warm and happy stitching!! It's been a hard winter alright. Your sampler is looking good. I also love that last piece you showed. The colors look so pretty. Stay warm!! Love the different pieces!! !